Hello and welcome to the fourth day of the Papertrey Ink November countdown and the first Design Team group post! 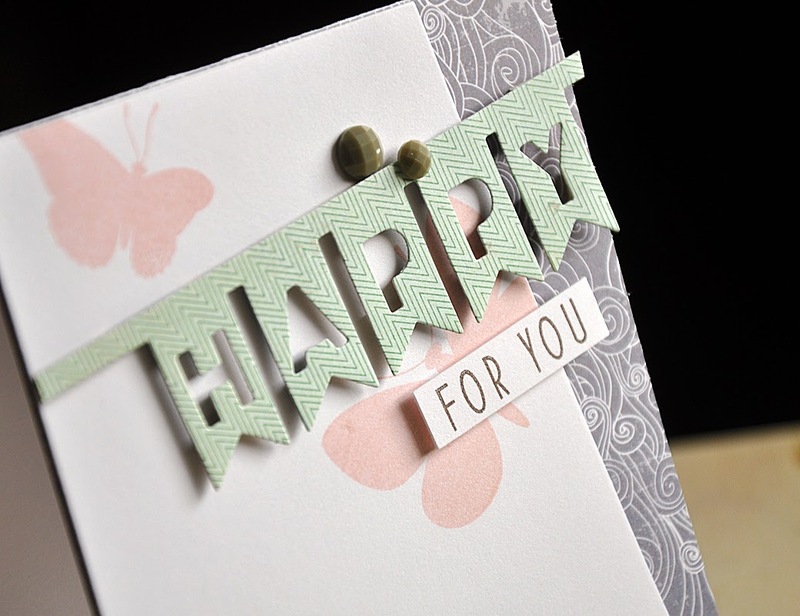 Today's group post is all about showcasing the new One Lines: Happy dies and the companion stamp sets, Everyday Happiness and Year Round Happiness. I just adore this new die set, they make the perfect companion to just about any old or new set included in my stamp collection (and yours too!). Plus, the coordinating sentiment sets make covering any occasion a breeze! This first happy number features the banner one-liner die combined with the previously release Beautiful Butterflies stamp set. Aren't these Tipped Tops dies fantastic!!! They are so easy to work with and if you haven't already noticed, totally up my alley! Thanks Nichole for inventing these priceless tools. More info on them here. This banner just looks so happy when cut from pretty pattern paper and pairs perfectly with the "for you" from the new Everyday Happiness stamp set. A few gray gems finish the card off perfectly. My son and I just adore his teacher this year! I can't wait to send her this happy little note to share just how much we enjoy having her this year. I stacked a few "happy" one liner die cuts (cut from a fun assortment of pattern papers) along with a sentiment strip from Year Round Happiness and apple from Apple Prints. Well, that concludes my look at One Lines: Happy dies and the companion stamp sets. Just remember... this collection will be available for purchase through Papertrey Ink, beginning November 15th. I love ehe idea of stacking the die cuts. That teacher card is so creative. Love these Maille! Great designs and use of the fab new one liners. Love these! The happy banner is awesome! Awesome. The teacher card is way special. Gorgeous cards, Maile! I'm sure your son's teacher is going to love the card you created for her...there's nothing better than having a great teacher! What a treat it is to check out your release projects. 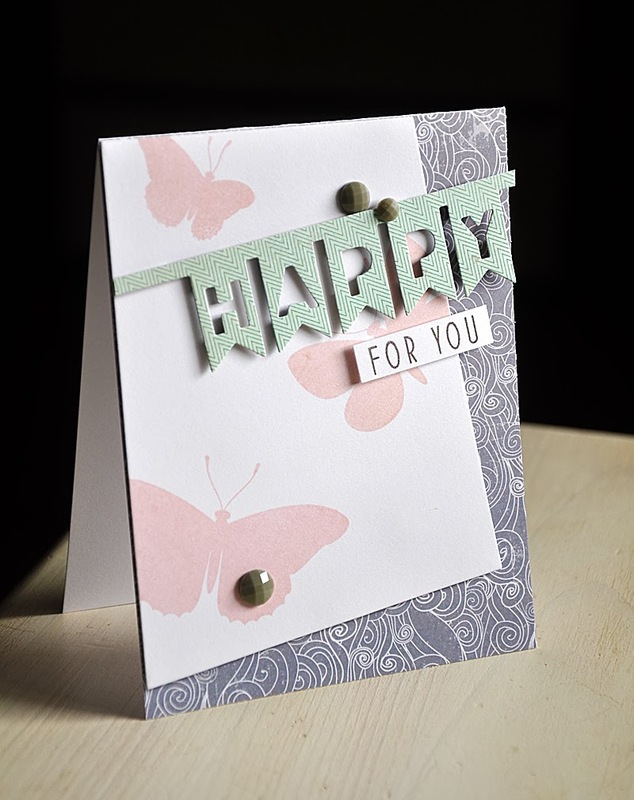 Love, love the butterfly card! Thanks so much. Absolutely adore how those one liner dies look stacked and angled. Thanks for sharing. Really like the choice in color combinations with your cards. The ideas are great. Love all the layered look!!!!!! The one-liners are right up your alley - beautiful, as always! Beautiful cards! Love the happy, happy, happy card! Appreciate seeing the banner one-liner cut out of patterned paper. Looks totally different than cut from plain cardstock. And your stacked one-liners create an awesome focal image. 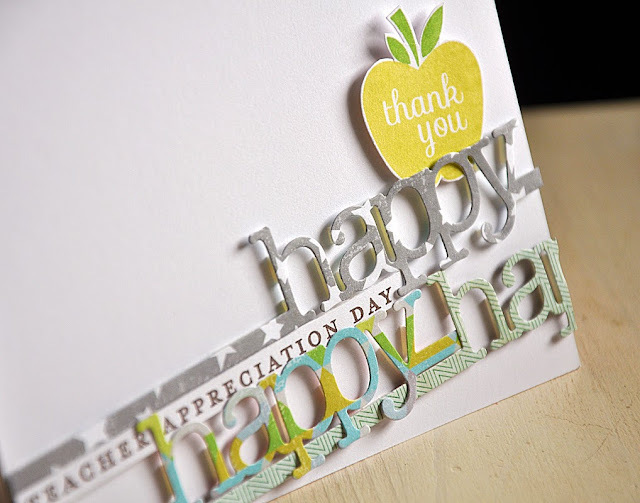 His teacher will adore this special card, and it sounds like she deserves it. That is SO cool.